What makes a Team Tick? Often it is commented by our clients, “Diana, you have a great team,” “everyone works so well together,” “everyone is so helpful,” etc. No one knows that more than I do. Each one of the staff at Central Park Business Centre Team goes out of their way to help our clients on a day-to-day basis. This is why I felt that the Team was in need of some pampering too. It is good for them to “feel” what it is like to be on the receiving end of great service. So, this past weekend we set out for a weekend at Whistler for some pampering and Team bonding. 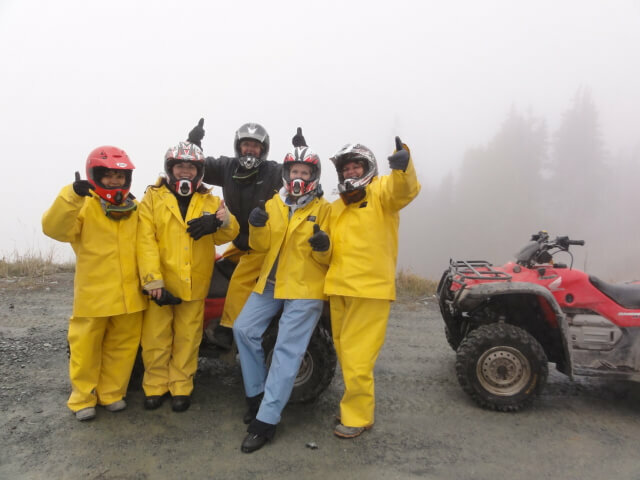 First on the agenda was something none of us had tried before — getting down and dirty on some muddy mountain trails on ATVs (all-terrain vehicles, also known as “quads”). We found out that Jodi-Lynn is the dare-devil in our group taking those deep mud puddles at full-throttle with great glee on her face! Dawna started out more cautious and slower, but with Nathalie riding with her and cheering her on to target all the puddles and bumps, she quickly joined in with squeals of laughter. Diane and I, riding together, joined in the fun but showed our age by slowing down for the big ones! 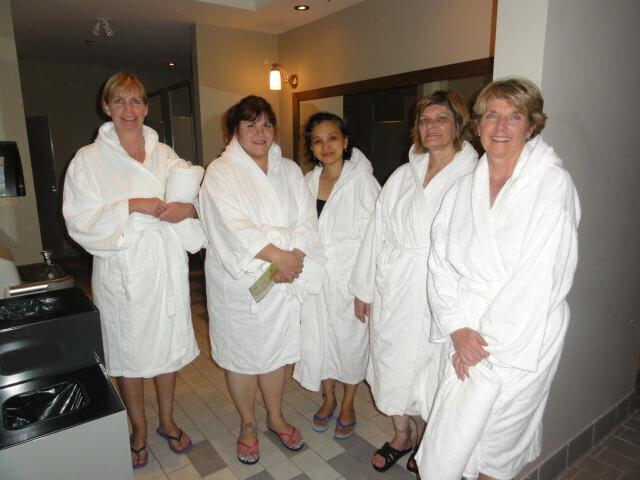 Then, to work out the kinks in our tense muscles, we headed to the Scandinave Spa with swimsuits in hand. The rustic but casually elegant mountain lodge set in the forest overlooking the surrounding mountains, was heavenly! We sauntered from the eucalyptus steam sauna to the dry steam pavilion, to the large hot pool with its gentle, soothing waterfall and pulsating jets that relaxed tender and tight spots, and ending up in the relaxation lounges with soothing spa music. Dawna and Diana even braved the Nordic plunge … for a few brief moments. Diane and Jodi-Lynn nodded off in the relaxation lounge, and Nathalie did the same in the hammock. Now that was a Zen experience from start to end! A sumptuous dinner in the Whistler Village at Black’s Pub settled next to the fireplace, satisfied our hunger pangs and feeling of warmth and comfort on a cold and wet evening. We then headed back to our chalet to relax with some wine, all cozied around the fireplace. After calling it an early night, everyone was treated in the morning to full-body massages by Harmony Massage Therapists who provide convenient in-home service. Ahhhhh! It was a wonderful start to the day! When clients today were asking, “so how was your weekend?” The most common response was ripples of laughter. Why you ask? Well, it probably had something to do with the unexpected chain of events not mentioned above, involving BCAA, a tow, a cab-ride, a borrowed car, a police check and on-the-fly problem solving. 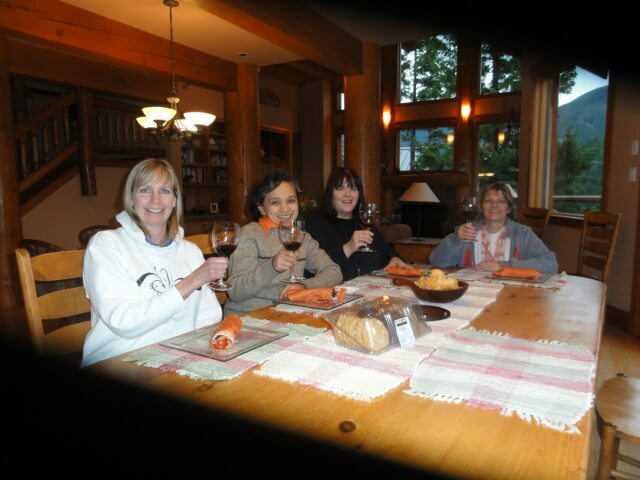 Now that’s a much longer story — and what happens in Whistler, stays in Whistler! And that is great for team bonding!